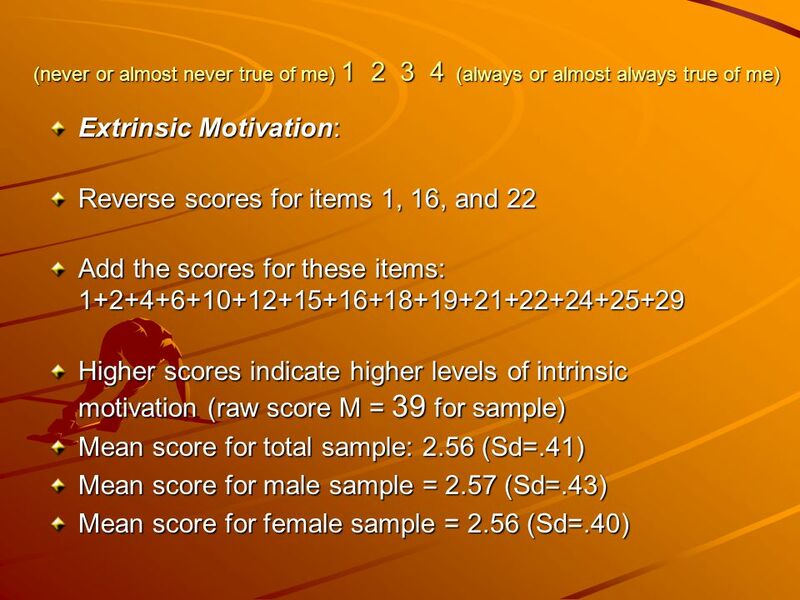 Motivation and Learning Work Preference Inventory: Intrinsic & Extrinsic Motivation. 3 Number your paper from 1-30. Respond to each of the items using the scale below. 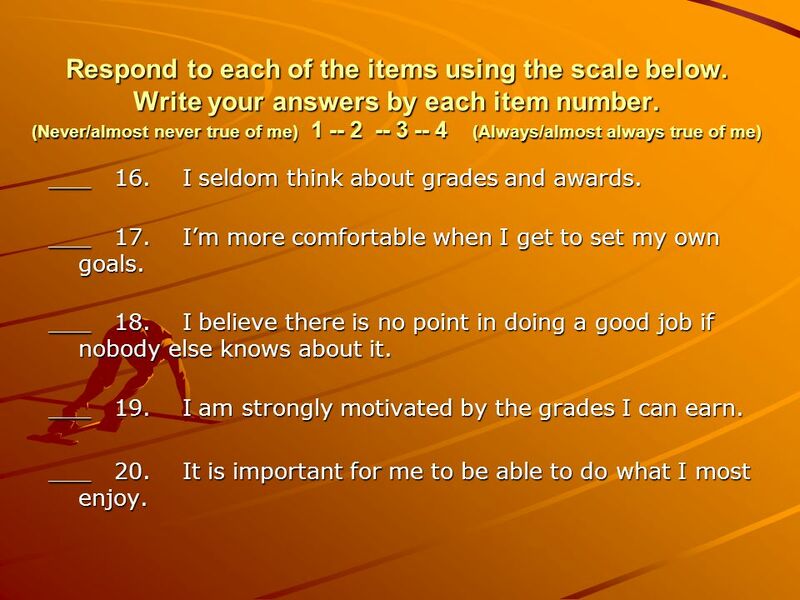 Write your answers by each item number. (Never/almost never true of me) 1 -- 2 -- 3 -- 4 (Always/almost always true of me) ___ 1. I am not that concerned about what other people think of me. ___ 2. I prefer having someone set clear goals for me in my work. ___ 3. The more difficult the problem, the more I enjoy trying to solve it. ___ 4. I am keenly aware of the goals I have for getting good grades. ___ 5. I want my work to provide me with opportunities for increasing my knowledge and skills. 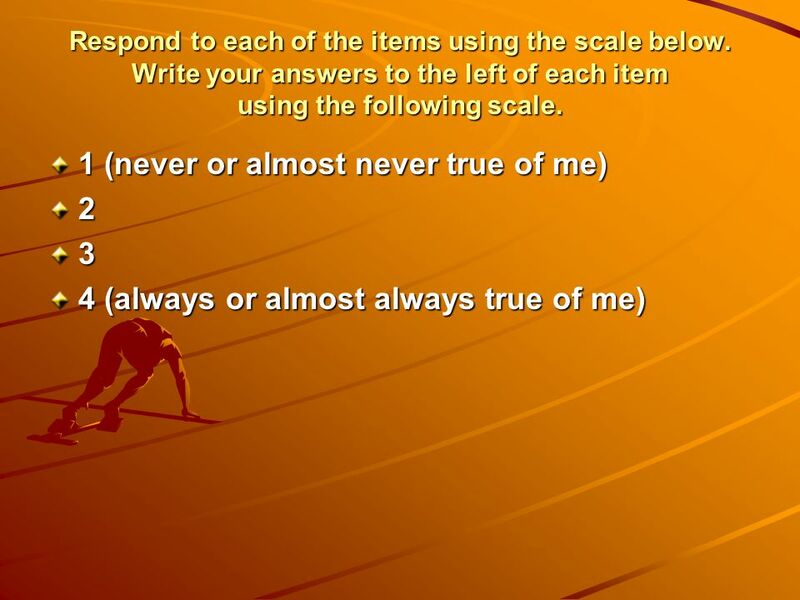 4 Respond to each of the items using the scale below. 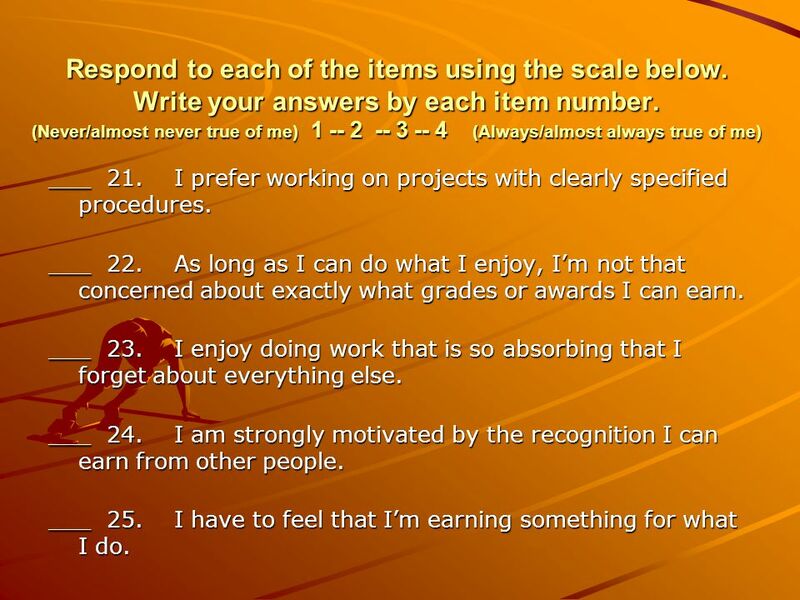 Write your answers by each item number. (Never/almost never true of me) 1 -- 2 -- 3 -- 4 (Always/almost always true of me) ___ 6. To me, success means doing better than other people. ___ 7. I prefer to figure things out for myself. ___ 8. No matter what the outcome of a project, I am satisfied if I feel I gained a new experience. ___ 9. I enjoy relatively simple, straightforward tasks. ___ 10. I am keenly aware of the GPA goals I have for myself. 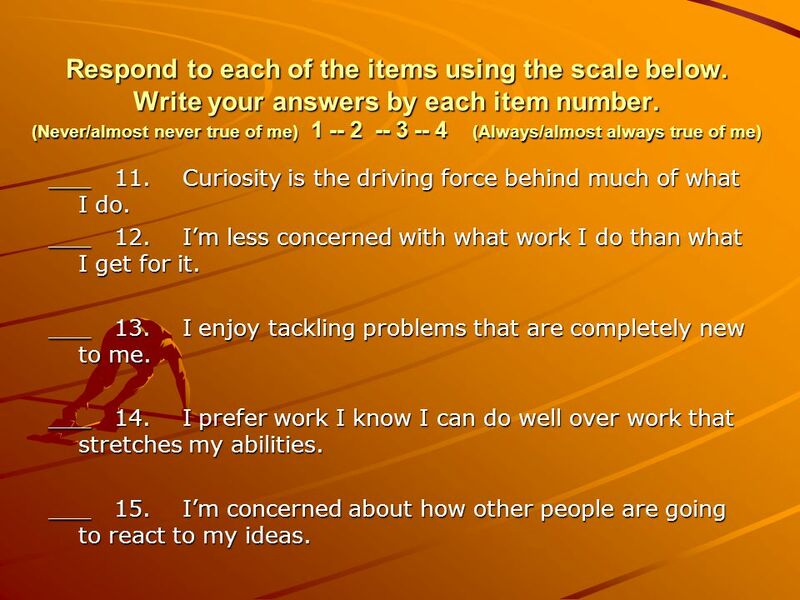 5 Respond to each of the items using the scale below. Write your answers by each item number. (Never/almost never true of me) 1 -- 2 -- 3 -- 4 (Always/almost always true of me) ___ 11. Curiosity is the driving force behind much of what I do. ___ 12. I’m less concerned with what work I do than what I get for it. ___ 13. I enjoy tackling problems that are completely new to me. ___ 14. I prefer work I know I can do well over work that stretches my abilities. ___ 15. I’m concerned about how other people are going to react to my ideas. 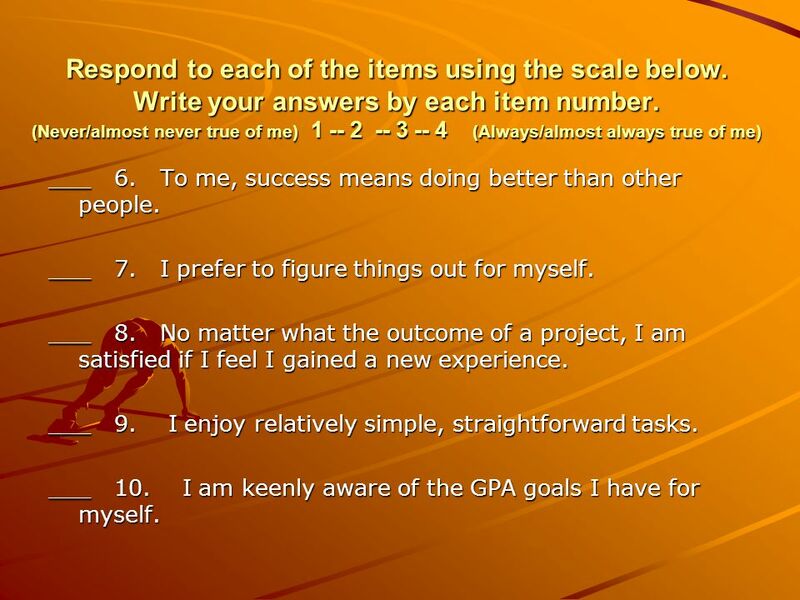 6 Respond to each of the items using the scale below. 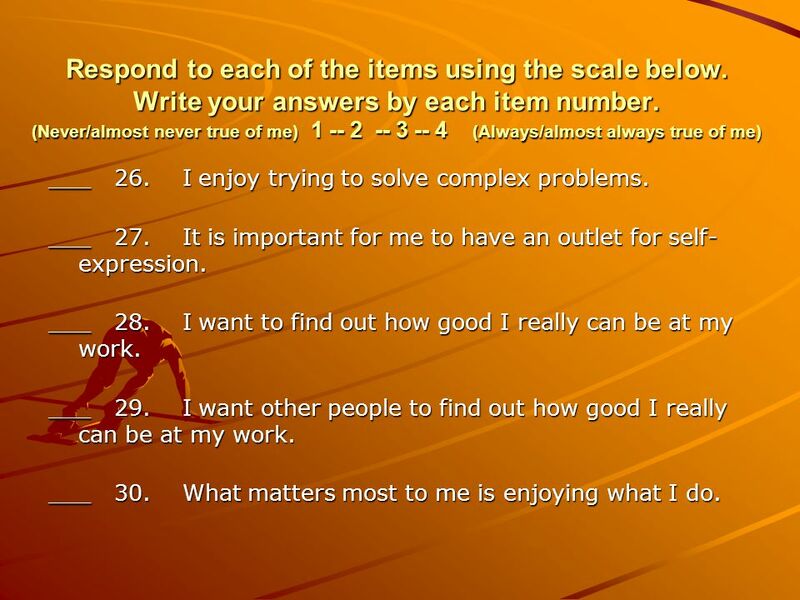 Write your answers by each item number. (Never/almost never true of me) 1 -- 2 -- 3 -- 4 (Always/almost always true of me) ___ 16. I seldom think about grades and awards. ___ 17. I’m more comfortable when I get to set my own goals. ___ 18. I believe there is no point in doing a good job if nobody else knows about it. ___ 19. 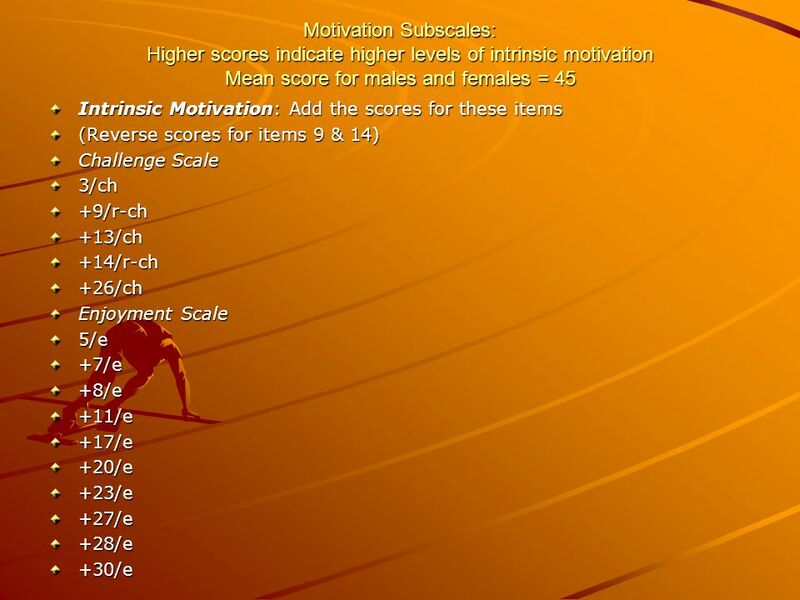 I am strongly motivated by the grades I can earn. ___ 20. It is important for me to be able to do what I most enjoy. 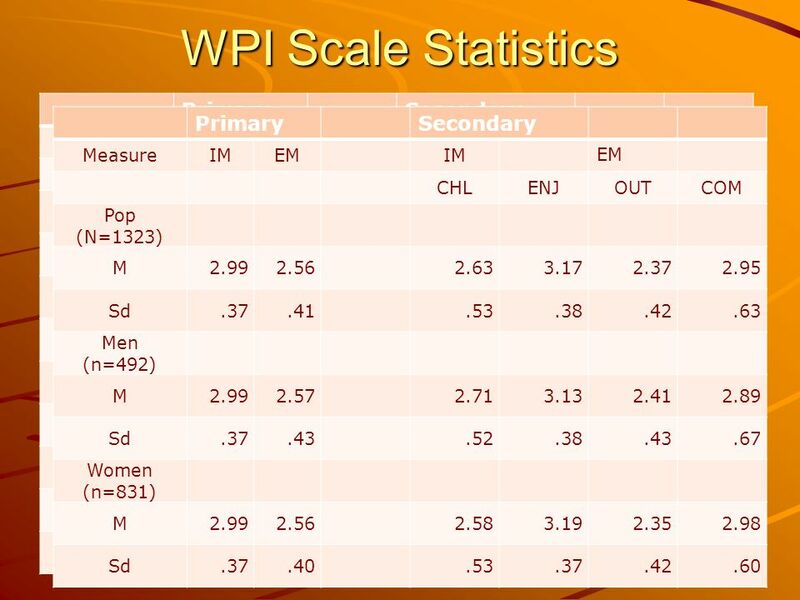 7 Respond to each of the items using the scale below. Write your answers by each item number. (Never/almost never true of me) 1 -- 2 -- 3 -- 4 (Always/almost always true of me) ___ 21. I prefer working on projects with clearly specified procedures. ___ 22. As long as I can do what I enjoy, I’m not that concerned about exactly what grades or awards I can earn. ___ 23. I enjoy doing work that is so absorbing that I forget about everything else. ___ 24. 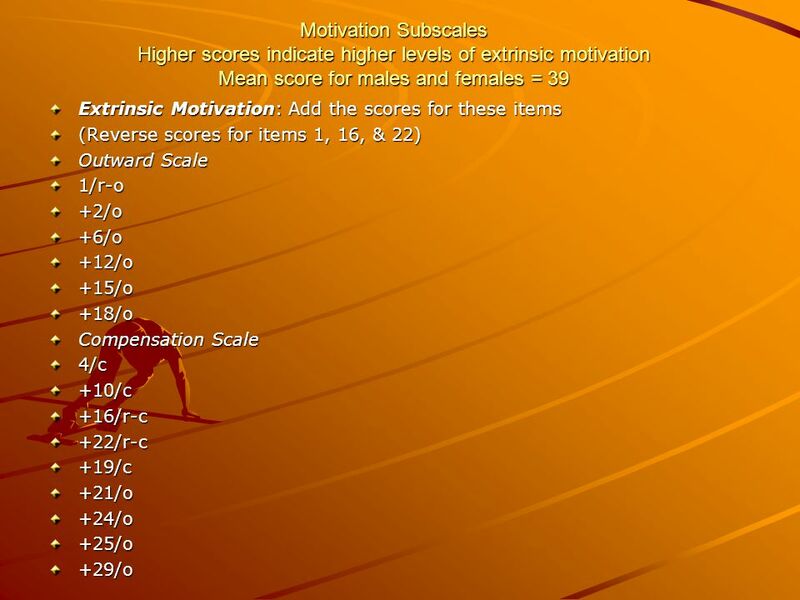 I am strongly motivated by the recognition I can earn from other people. ___ 25. I have to feel that I’m earning something for what I do. 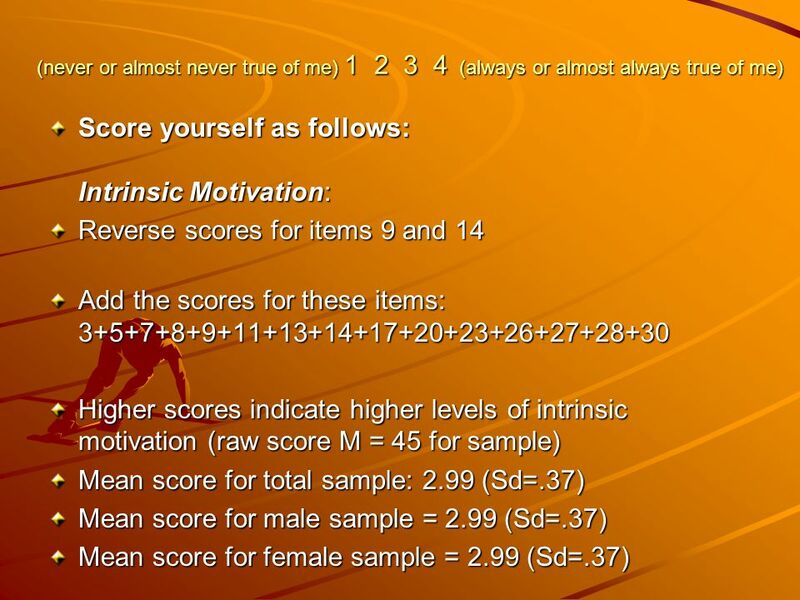 8 Respond to each of the items using the scale below. Write your answers by each item number. (Never/almost never true of me) 1 -- 2 -- 3 -- 4 (Always/almost always true of me) ___ 26. I enjoy trying to solve complex problems. ___ 27. It is important for me to have an outlet for self- expression. ___ 28. I want to find out how good I really can be at my work. ___ 29. I want other people to find out how good I really can be at my work. ___ 30. What matters most to me is enjoying what I do. 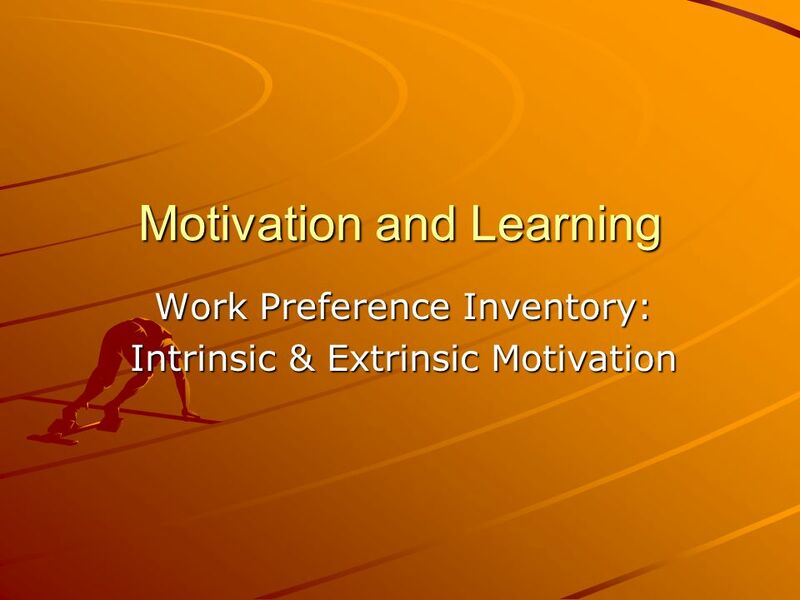 Download ppt "Motivation and Learning Work Preference Inventory: Intrinsic & Extrinsic Motivation."